There is a popular quote which says “Everything gets better with Coffee”. For many, the start of a good day begins with a good cup of coffee and there are many who put a lot of thought into what goes into their first beverage of the morning. Keurig coffee makers are beverage brewing machines that have been designed for home and commercial use. The Keurig K55 coffee maker is a popular product which brews over 500 different K-Cup pod varieties from 75 brands which include Starbucks, Lipton, Green Mountain Coffee and many more. The Keurig K-cups pods are single-serve coffee containers. At the push of a button the Keurig coffee maker delivers excellently brewed coffee, tea, hot cocoa, and a few other beverages to its users. The Keurig K55 review intends to highlight the best features, the pros, and cons of this best-selling product and how it fares when compared to its competitors in the market. The Keurig K cup pods brews beverages in 3 different sizes 6, 8 and 10 ounces. The coffee machine has a 48 oz., water reservoir which allows the user to brew several cups before having to refill. This is a conveniently sized reservoir which can easily produce up to 8 cups before it needs to be refilled. There is a light indicator to show when one needs to refill the reservoir. Also, this is a detachable unit. The product comes with a detachable drip tray. The machine comes with a single-touch button controls. The Auto- Off program ensures that the brewer is turned off automatically when not in use. The indicator lights on the machine show the function or mode that is currently in progress. The product measures 9.8” wide and 13.3” each in height and depth and weighs about 12lbs. The Keurig coffee maker is a very popular brand and has many advantages and a few drawbacks. The versatility of the Keurig coffee maker is such that it doesn’t make good coffee alone. It can brew a variety of other beverages like tea, hot chocolate, even iced coffee and tea and other special beverages. This is a coffee maker which is easy and simple to use. The pre-heat system ensures that the water heats up adequately, which means that the time taken to prepare your beverage is very less. The water reservoir is large enough to hold 8 cups of water which means the refilling need not be done very frequently. The light indicates whenever the water needs to be refilled in the reservoir. Also, the water reservoir and the drip tray are detachable units which makes cleaning convenient. The auto programming ensures pre-heating when the power is switched on. This auto function also ensures that the machine switches off on its own, when it has not been in use for a long time. The light indicators show instructions when as to when descaling is required, making it convenient for the user. The drip tray can be removed if taller cups/glasses must be accommodated. The Keurig K-Cup is a re-usable coffee filter which allows the user to brew any coffee bean and not be restricted to using only pre-packaged K-Cups. There have been complaints about the build-quality and durability of the Keurig K55. There are also complaints about the descaling function not performing properly after sometime. The Keurig K55 vs K45 doesn’t arise at all because the latter is no longer being manufactured and there is mild to no distinction in terms of performance and features between the two versions of coffeemakers. The single cup brews may get a little tedious when there are many cups to brewed. How does the K55 fare when compared to other coffee machines in the market? The Keurig machines are very popular in the single coffee brewer market. The designing and performance of the K55 is in a class of its own. This is one of the best-selling models of the Keurig brand of single coffee brewing machines. The features and advantages listed above indicate how the price is well-worth the product. When compared to other models and brands, the K55 is a notch above in terms of brew quality and time. The versatility of this coffee maker is also a big plus. 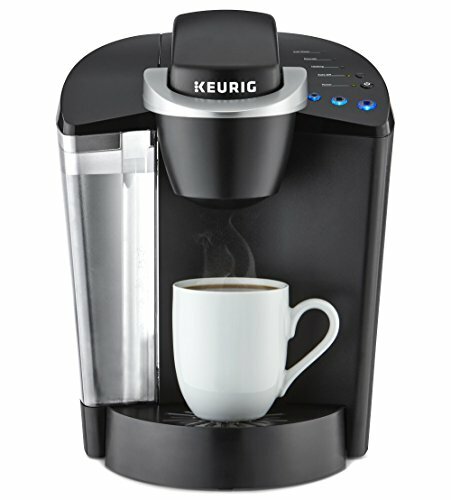 The Keurig K55 reviews indicate that this is a value-addition to any kitchen. The sleek design and simple to use functions make the Keurig K55 an impressive and highly recommended product. 3 How does the K55 fare when compared to other coffee machines in the market?